Possibly the most famous service station name in the country - so it's a bit of a shame that it looks no different from most other services. Still, given that it has been there for almost 60 years, it's quite an achievement that it's able to keep up with the others. First two hours free for all vehicles, after which cars must pay £20 and HGVs, caravans and coaches £26, or £28 to include a £10 food voucher. Prices are paid using PayByPhone - more details or in the shop or restaurant. The location code is 5252 (northbound) and 5253 (southbound). 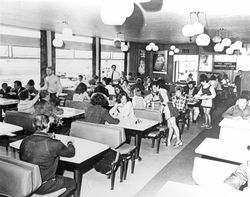 Cramped but popular - the original restaurant. The traditional 'gateway to the north', Watford Gap probably manages to be both Britain's most famous and most infamous motorway service area. It has also managed to convince the world's press that it's the oldest. Going right back to the days of The Blue Boar, Watford Gap has seen highs and lows that have all shaped Britain's motoring culture. The filling stations are operated by BP Express. Watford Gap was where Roadchef trialled WHSmith. It was a success and has since been rolled out at all their services. 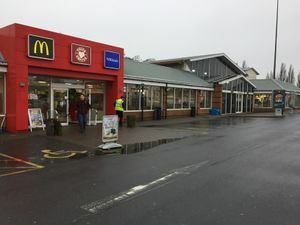 In 2010, a large redevelopment of the northbound services saw a new entrance created, and the restaurant reduced from a large Restbite servery to a smaller Hot Food Co. counter. In 2012, this was changed to Roadchef's trial restaurant Fresh Food Café. Pizza Rossa was trialled on the northbound side for a short while within the Fresh Food Café unit, but it wasn't continued. They were also going to open another unit in Norton Canes but this never happened. Roadchef's first Carvery Express opened here on the northbound side in September 2015. It was removed in 2017 following an unsuccessful trial.